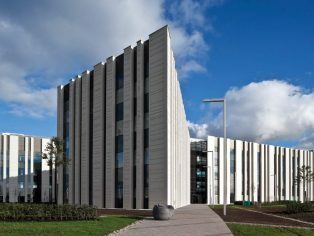 When the Scottish government commissioned the Scottish Crime Campus, the driving purpose was to create a secure campus, which would enable closer and more joined up working between the Specialist Crime Division of Police Scotland and its partner agencies. The new building had to create an environment that facilitated and encouraged communication and more collaborative working. 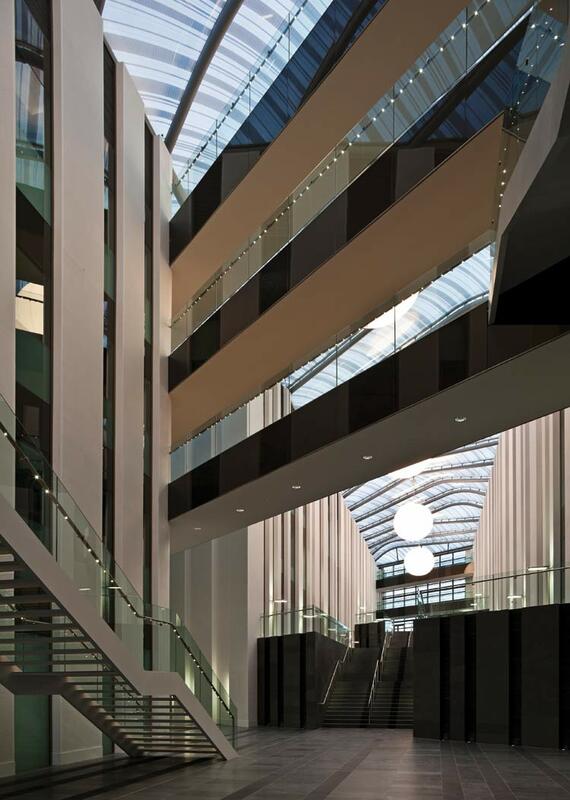 To help achieve this, Ryder Architecture’s design placed an atrium at the centre of the 12,600 sq m building. This light filled heart of the campus gives stunning views across the Campsie Hills, as well as being infused with the daylight streaming down through the translucent patterned ETFE roof. 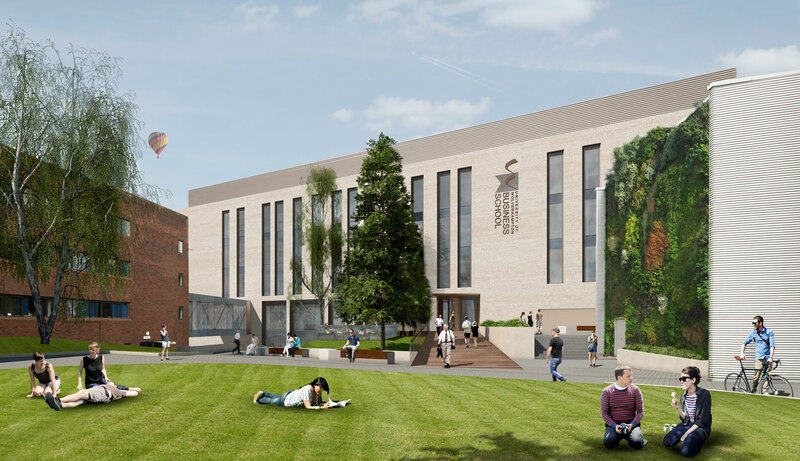 The campus comprises four connected elements which form a U-shape around a central atrium space running on a north-south axis. The idea was developed for a series of buildings, whose ground plan was based on the legs of a chromosome, arranged around a common space sitting above the exposed geology of the site, which formed a base, internally embodying and enclosing secure spaces. The primary circulation is at the centre of the building, the atrium, at the point where the two chromatid shapes would touch. Connecting bridge elements through the atrium were also initially inspired by DNA chain connections. These concepts were the starting point for iterative processes whereby design options were tested in terms of accessibility, legibility, internal ambiance, environmental performance and structural expression, which ultimately permitted a solution with some depth and purpose. Many of the functions carried out within the building are concerned with identity and identification. 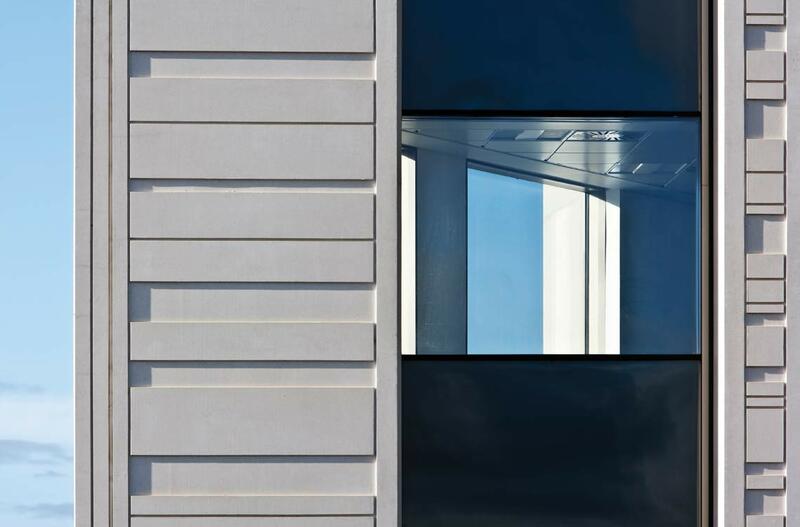 The façade and building concept take some of the visual references associated with the process of identification and abstracts them to give the building itself, as well as the working environment, a clearly recognisable identity. 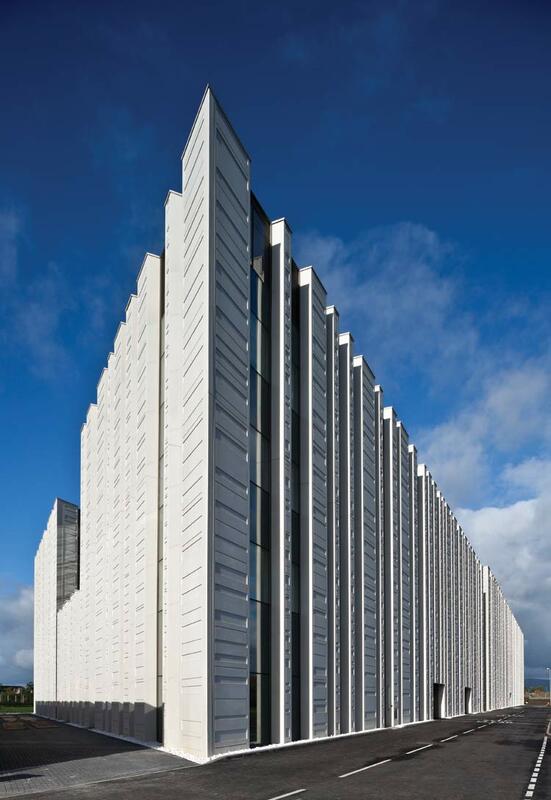 Vertical orientation of the façade breaks up the horizontal massing, providing rhythm and variety, and was inspired by various visual references, including DNA sequence art, barcode band artworks and fingerprint dermal ridges. These visual references generated a theme which was repeated through the landscape design, façades and finishes within the atrium and throughout the building. A limited number of standardised bands of solid masonry are repeated in sequences around the façade in arrangements which reference the male and female chromosome sequences. These waves are more dense at closed elements of the façade (stair cores, private areas) and provide contrast at large glazing areas. These further contribute to the dynamic, flowing appearance of the building. Overall the walls of the building have relatively low percentage glazing to solid elements. Solid elements are higher to maximise the insulation potential of the building. Conversely, all internal areas have a high percentage window to the external wall when viewed from the inside. This is to maximise the available views out and daylighting potential. The distinct role of each wing is in contrast to the collective space of the atrium which it embraces as the agora or meeting place – where ideas are shared. All agencies use the atrium space, making it the social core of the building, the place where employees meet, interact and circulate. This interaction encourages the dissemination of ideas and helps create a sense of community. 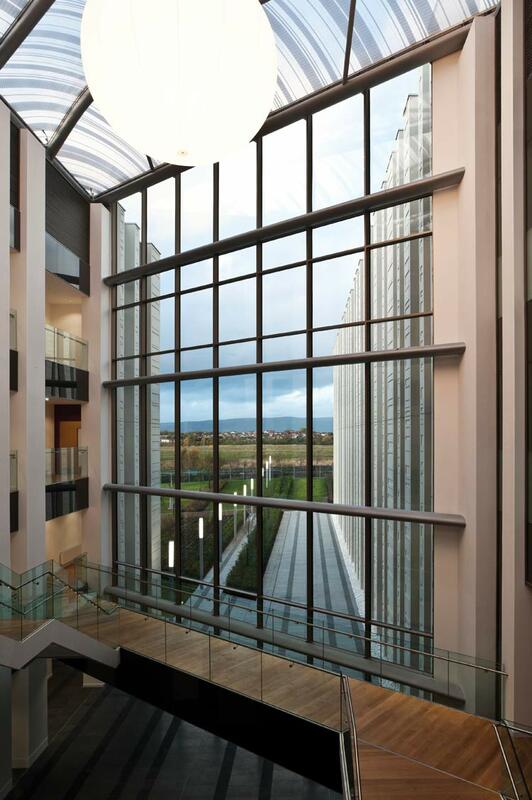 The atrium is aligned to offer the best open views of the Campsie Hills to the North, with the western wing being redirected to create an open appearance, capturing north light. Its design fosters a clear inside outside connection, with glazing taken down to the lower floor of the space, opening up the view, and helping to prevent the building from feeling too insular. This is further enhanced by the use of similar materials either side of the atrium glazing. 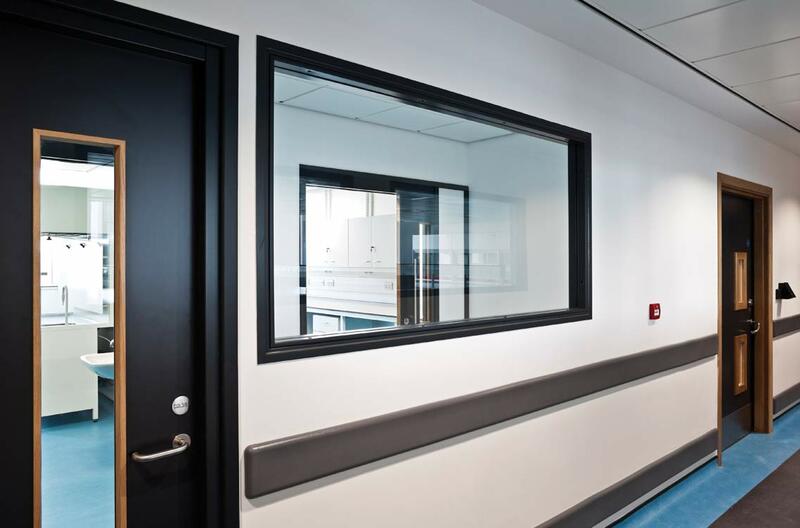 Compact floor plans minimise external wall area to reduce heat loss through the façade and high floor to ceiling height encourages natural daylight penetration from the outside and atrium. 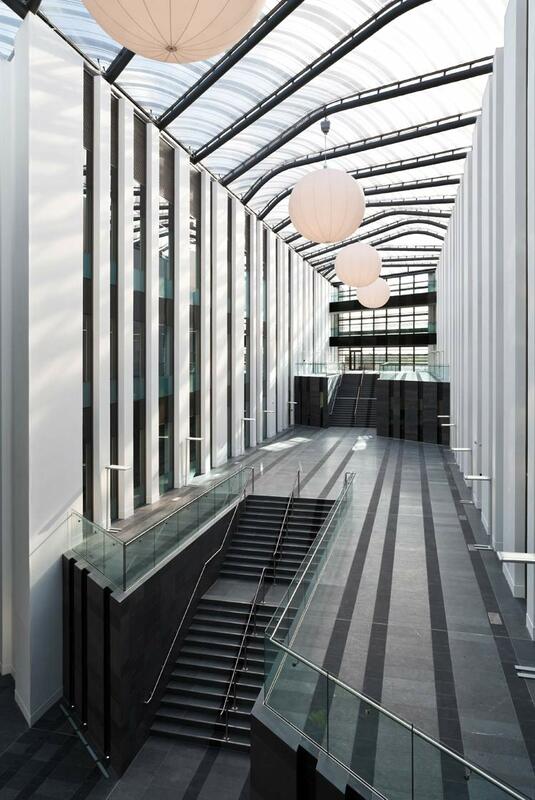 Research into potential roofing materials resulted in the selection of ethylene tetra fluoroethylene (ETFE) as an alternative to glass in the atrium roof. 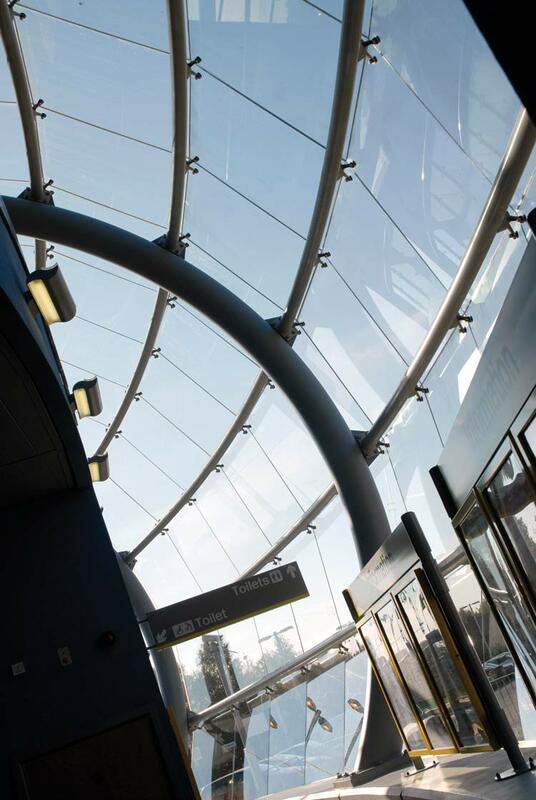 ETFE is a transparent, durable material unaffected by atmospheric pollution and UV light. The material does not harden, yellow, or deteriorate over time. The supplier chosen was Vector-Foiltec, a specialist in the material whose projects include the Eden Project and Heathrow Terminal 5. The ETFE was formed into 3-layered, inflated cushions providing 29 roof panels, totalling 1,196 sq m. The membrane and its supporting structure were aligned to enhance the dynamic geometry of the building and atrium. Moreover, the lightness of the cushions enabled the creation of a roof that combined an inspirational, soaring elegance with practical characteristics such as the ability to dissipate loads, absorb stresses and accommodate building movement. The pillows also had the advantage of being acoustically transparent and as a consequence do not reflect internally generated noise back to the occupants. 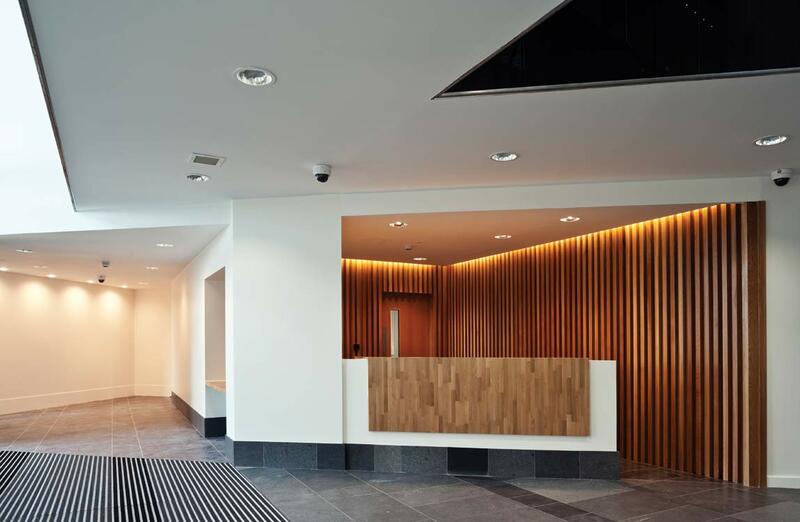 The atrium’s internal environment is therefore considerably more comfortable than if an acoustically reflective material had been used, a key advantage for an area focussed on encouraging conversation and communication. The DNA and chromosome patterning that was the recurring theme in the design of the façade and building concept was carried across to the atrium roofing. In a project top secret at the time, the cushions were to be printed with a bespoke pattern, created between the design team and the manufacturer, but at first there were problems. 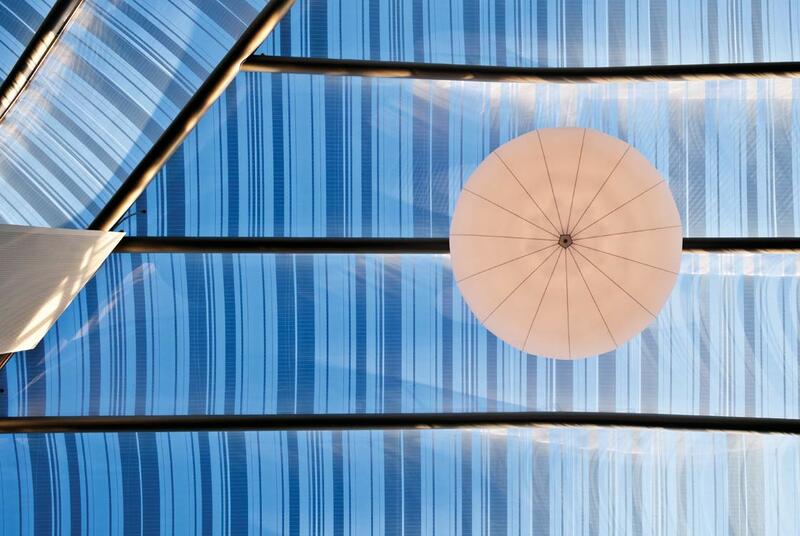 Initial runs of the model made the ETFE roof entirely opaque, so it was necessary to take into account the densities of the translucent and clear materials on the barcode. Vector-Foiltech verified that the shading coefficient was actually achievable with the ink densities needed for the coatings and were able to reproduce different optical densities and patterns on the same roll, rather than using a variety of different patterns to meet the requirements. This required close collaboration with Vector-Foiltec’s factory in Bremen and the printer and the architects from Ryder, to ensure that the balance was perfect. The print pattern not only had to meet the design’s aesthetic requirements, it also had to meet tough solar gain and thermal requirements, 0,400 G-value and 1,96 U-value, respectively. 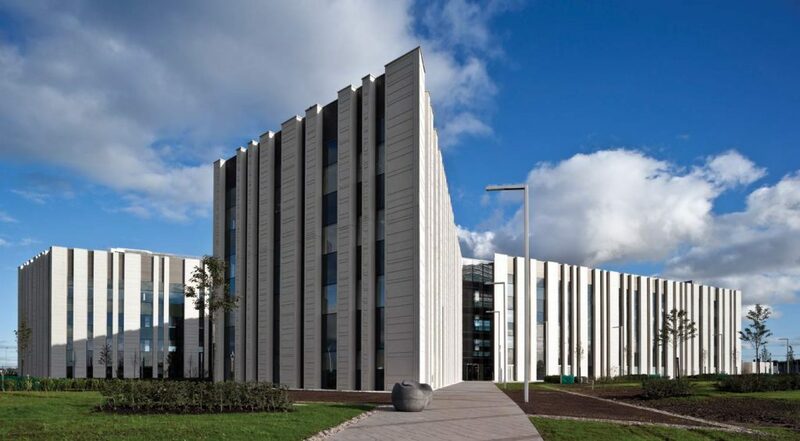 The Scottish Crime Campus is a unique project in Scotland. 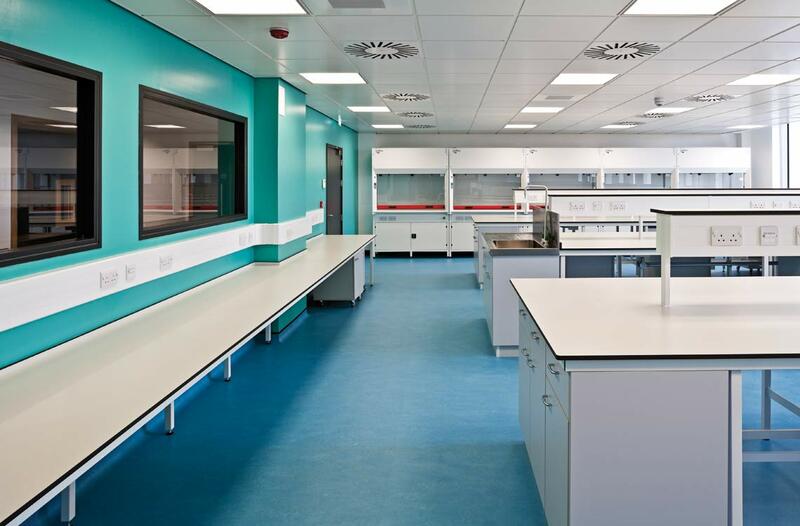 Not only is it the Scottish government’s largest single investment in as-built support facilities, but it is also an exemplar of design led programmes as embedded in the National Architectural Policy – creating places, first life, then spaces, then buildings.